During the Dirty War, the children of Argentina went missing. In homes, parents awoke to find empty beds; in market squares, they felt small hands slip swiftly out of theirs, out of sight, gone. The military had been snatching children of political dissidents. They dropped them into the disappearing holes of adoption agencies or tortured and killed them, leaving them in the nearest ditch, all in an effort to intimidate those that opposed the powers that be. All in an effort to silence. But the grieving mothers of these boys and girls would not be silenced. They took to the streets, marching straight to heart of the state: the Presidential Palace. As they moved, swift like a storm, they sang a song that reflected both their broken hearts and their righteous rage, their demands for justice, for fairness, for a world where their children were still in it. They sang Mary’s song. The Magnificat. Mary’s words, drawn from the depths of her defiant soul towards the hard road before her, have long been an ominous threat to those in power. In India, the song was banned from being sung, even in church, because the Brits saw it as an act of aggression. The same happened in impoverished Guatemala the government of which feared the idea of a lower class with hope. Mary was seen a symbol of insurrection. A threat. I too grieve for the owners and employees who watched their livelihoods literally burn to the ground. I grieve for the Public Library, all those books, now in a heap of ash. Looting should make us grieve. Pain is pain. But I am careful to watch how the anger moves from loss of life to loss of property and how the general public gives greater weight to the latter. I am careful to remember the way the camera zooms in on the burning buildings and away from the candle lit vigils and the crowd chanting for reform and those doing the difficult work of drafting petitions, defiantly seeking out avenues of change in a system that is dead set against them. The God Mary sings to is one who wishes to bring down the powers that accept the deaths of Michael Brown and Trayvon Martin, the imprisonment of Marissa Alexander, so they might bolster the system that will do it again and again. 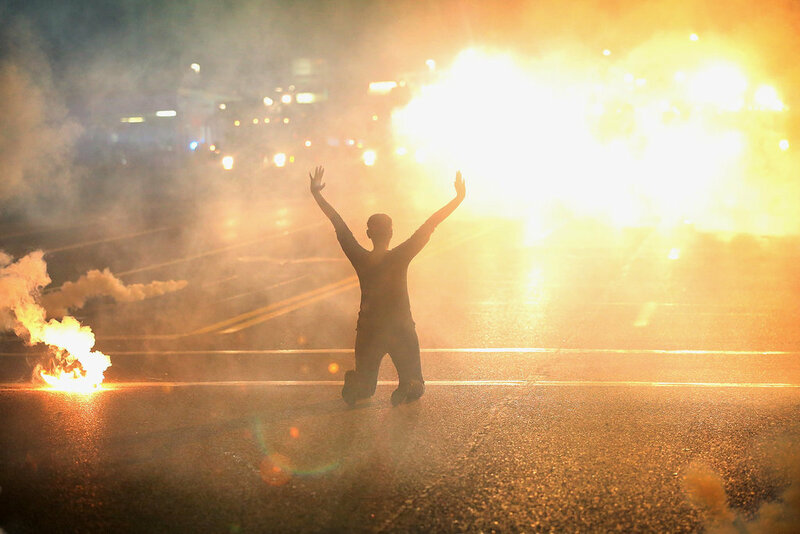 It’s the God you will find in the Ferguson masses, chanting along in their weariness and their frustration. Shouting something that shouldn’t have to be said: Black Lives Matter. Standing through tear gas and intimidation, refusing to go down. Holding out hope for a country where they don’t have to defend their right to exist. Advent is for Ferguson, for the Magnificat, for the mother’s of Michael and Trayvon and countless others, for the oppressed longing for Kingdom come. It’s for all of us to stand in solidarity, to be silent no more. When I think friendship, I think of the girl that sat and talked and cried with me on the dock, the night before I left for Kosovo. I think of the afternoon so many of us ran through a thunderstorm, laughing loudly, slipping on the grass, wet to a chill. When I think my people, I remember our hands resting on her back as she sobbed into the steering wheel on a truly tragic night. When I think relationships I think presence and proximity, I think touch. To me, real relationships have always been the unedited, unfiltered lives of my family members and college roommates and coworkers. The imperfections and flaws are critical to the love shared, seeing them in their spontaneity, in their mess-ups, in their weeping, has revealed more to me about them than any bio they could write. Any post they could pen. The closeness, here, feels critical. I couldn’t imagine us growing into another any other way. In my early days of blogging and twittering, I didn’t know what to call people I talked often with “online.” Friend felt too intimate and stranger certainly wasn’t accurate. I didn’t know how to categorize these conversations that created inside jokes, deep familiarity, secret-telling, and then mutual concern, a kind of vested interest in each others’ personal day-to-day lives. It was all so different. So new. So scary and oddly soothing. I couldn’t figure out what to make of it. Sometimes I’d leave the internet in an effort to unplug, or just because life demanded too much of me, and when I’d come back, I’d notice messages from people who were asking where I was. Why I didn’t respond. Was it something offensive they said. I had unknowingly hurt people or made them angry, several relationships ended. I freaked, a little. I didn’t know how to handle the sudden pressure to show up for each of these friendships, scattered as they were across social media platforms. So I stopped responding altogether. I stopped chatting. I stopped using social media to be social and started utilizing it as a tool in the construction of my “platform”. I decided that this wasn’t me- no, it wasn’t anyone. It was exactly what Orwell and Huxley had been warning us about. I was confusing life with the machine, the artificial with the authentic, I had to stop. And I was wrong. Well, sort of. The internet never will be nor should be the replacement to people to people relationships. It is not the ideal. I don’t wish for a world of all agoraphobics slowly wasting away in their beds behind brightly lit screens. As I’ve been getting better at keeping up with internet friends, albeit slowly, I’ve learned that it isn’t the medium that renders these relationships bad or unfruitful. It’s the people involved. Just like Real Life. And I’ve even witnessed, first hand, how these friendships made in these mediums are not separate from real ones and wouldn’t necessarily be different if they were played out in our day to day lives. Somehow, they stream effortlessly into the same bond. I could tell you all about meeting twitter friends for coffee and the brief mental conflict between thinking their avatar and seeing their skin and bones, but then watching the conversation fall out effortlessly, for hours. I could tell you about the Portland bloggers that many of you read. One called me the night of the World Vision backlash and told me I am his brother and I belong in the church. Another left me a vox (which is like a voicemail app), with a prayer she was praying for me after I had tweeted while I was at a party, sitting on a sofa beneath a conversation between two who spoke as if no gay person could hear them. Another called me one night, and she was the first blogger I spoke with over the phone. The two of us talked for hours about God and writing and dating and the difficulty of presenting a perfect faith online because you’re an outsider whose overcome expectations and you have to be an example. I could tell you all about a mom in Michigan who has showered me with so much encouragement and prayer and gifts from the Amazon bookstore. She shows up for me when I need to confess my mistakes and offers sure, steady words of wisdom that restores breath to my lungs. She’s also hilarious and an incredibly skilled writer and visual artist. She’s designing my next tattoo. I could tell you about the people of Deeper Story, and about other friends on twitter and Facebook and Voxer. 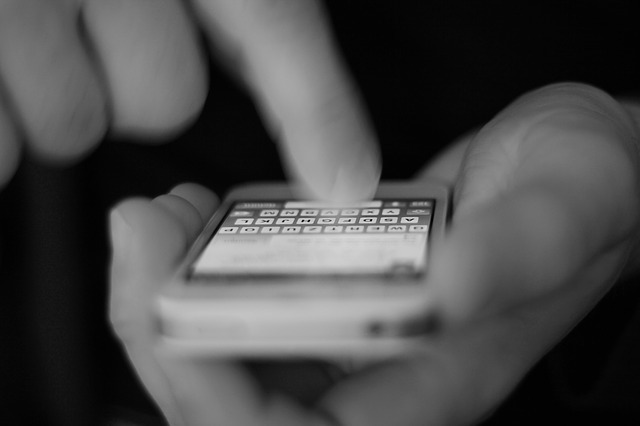 I could tell you how some of the most important conversations I’ve had, I’ve had over email. But I want to tell you why I started writing this post. I want to tell you about a funeral I attended recently. It was on a Sunday, and it ripped a gaping hole through our church. She reconciled with her son and became an activist in our church, joining a number of us seeking to bring about change through dialogue. My mom and her invited into a private Facebook group for moms of LGBTQ kids. The membership is far and wide, tacks all across the United States. And what they do there, primarily, is get to know one another and pray for one another. They celebrate good news together like stories of acceptance by relatives, by the church. They discuss ways to best support their kids, figuring out how Jesus would’ve handled all this. In the corner of the lobby of the church sat a large arrangement of vibrant yellow flowers. They were from the moms. The moms who walked with this woman through the devastation and exhaustion of her cancer, the ones most easily accessible as she lay bed-ridden. They prayed for peace. They affirmed God’s love. They held together as one large pillow she could lean into, rest upon. And they sent flowers in her honor. They changed their profile pictures in her remembrance. They stood in prophetic witness for a woman they loved, prayed for, wept with. A woman they had never even met. And I’m here to tell you now, despite it’s flaws, this internet is such a gift. It is pulling down the walls that have kept us away from each other for far too long. We were always meant to know and be known. It is making new paths for the lonely and bridging into communities all over. It is allowing us to live into that truth that we have always belonged to one another. This past year, church hasn’t been easy for me. It’s been a lot of seeking, not a lot of finding, and never being able to put my finger on what, precisely, I was looking for. You could call me “picky”, a real “Cafeteria Christian”, but that is only half the truth. I still go because I want to find God there. Yet 99.9% of the time, I just find myself vexed- hot and bothered by all the little things. I wish I could better articulate what it is that throws me off in church. Most of it is mixed up in my past experiences. Some of it is their failure to meet my sky high expectations. But in the moment, right or wrong, I feel justified in my cynicism and that righteous feeling becomes the steel grid through which every song and rhetorical flourish is harshly filtered through. I can tell you what makes me feel okay in Church. Trust. Thank God my brother is a pastor. Even though it’s a little ways away, I drive out to his church most Sunday nights and listen to him preach. I still come with my cynical stick, my instinctive edginess towards praise and worship, but I can really hear his words when he says them, because I know his heart. I trust him more than anyone else with a sermon. I’ve gotten to know some of his coworkers, too, who are all incredibly gifted and kind. I’ve watched them move with tact, making sure all the newcomers feel welcomed and safe without feeling pressured to participate. Apparently, though, I am no longer a newcomer. I was just quietly sneaking my way, five minutes late, into the sanctuary when she called my name. 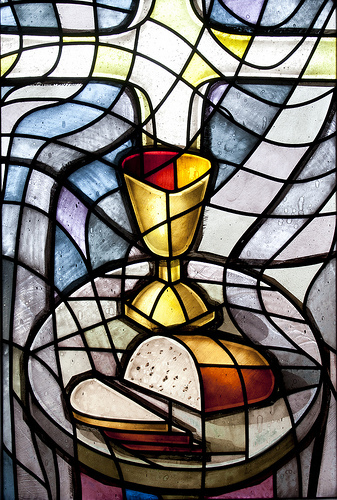 I have never served communion and to be honest, I thought to do so required some kind of certificate or training or in the least, a reputation for putting in hours in ministry. It’s supposed to be a privilege, right? Privileges like these are earned. I have not earned this. I deserve detention for all those early departures. For the zero cents I’ve put into the plate. The series Matt (my brother) was preaching on was on grace, that indefinable element to Christianity that sets it apart somehow. God came down. Matt said. He came to dwell amongst us. And He is for us. He went on to talk about Luke 7, the story of Jesus going to the home of Simon the Pharisee for dinner and not being welcomed as they would anyone else. They put the chill on, ignoring him when he walked in, not greeting him or taking his cloak or washing his feet, to in effect let him know the length of their arms keeping him at a safe distance. To let him know they didn’t buy into Jesus craze. Then the (likely) prostitute shows up, who (likely) met Jesus before. She rounds the room, uninvited but unconcerned about it, and falls to his feet, washing them with her tears, drying them with her hair, pouring them in the perfume she (likely) saved for her tricks. In what became a defining mark of Jesus’ ministry, he defends the woman from Simon the accuser. Simon calls her sinner, Jesus calls her saved. He looks at her with (likely) the most proud and grateful eyes. Go in peace, he says. I waited for the signal of the start of communion. The moment the co-pastor held up the broken bread, I saw five others rise out of their pews, make their way around to the corner table where plates and goblets awaited us. I walked, uneasily, down to the front, carrying the cup trembling with grape juice, and stood at the spot next to my partner, who, I gathered, was quite comfortable- possibly excited. Then the people of God came down. I knew the words to say without instruction. And I knew to look into their eyes, even though eye contact takes courage for me. And it’s here where the moment stops and sharpens into an impression. Me. A gay sarcastic skeptic suspicious of the institution, worried sick that God is actually more menacing than he lets on. Me. Standing front and center. Holding the cup. Lifting it up and out. Me. Me, often speechless in prayer. Often unable to provide a simple answer to those who are seeking and wondering about the faith I say I belong to- now speaking a simple statement of incomprehensible significance. Words I felt I could almost follow out of myself and into the lives of the community, of the church. Words I suddenly said with more seriousness than I have been able to convey authentically since I don’t know when. Me. And it’s not like I went back to the pew and found my cynical stick turned into a plowshare, I was still imperfect me. But, and here’s the thing, I found my faith embodied in a way I didn’t know it could be. These broken hands holding the gift of life. This sarcastic mouth speaking the holy words to a hundred thirsty people. And it does something to you, this Sacrament, moves you to the point of held back tears. To unsteady hands. A feeling you can’t quite pin down. It’s the grocery bought bread and juice, just plain grains and sugar, offered up like diamonds. It’s the imperfect people shuffling down the aisle with their pride and their fear, their capacity to do harm and to give life, their uncertain feet leading them to me, the most unlikely of them all. It’s the magic, moving into and through this very moment and somehow, changing everything. This is my blood shed for you. Always, always, always, for you.